that you had to navigate through a maze by means of two dials on the sides of the game. Sometimes I feel like I'm the steel ball and I don't know where I'm going in life or what I'm doing here. When I get really frustrated or 'lost' in a sense at a dead-end, I find I often start to blame God. 'Why do other people seem to have it so easy, God.... Why do I feel like I'm stuck in this set of circumstances and I can't get out.. serving you sure make my life a lot more difficult' etc. Whoa. Is that fair? Sounds almost like pre-destination to me. Wow. So then it seems like I could say that its not fair for God to blame me for the bad things I've done. Haven't I just done what He made me do? 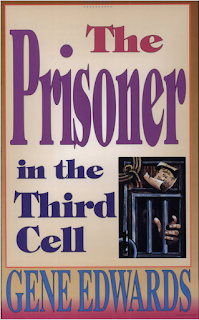 the Third Cell'. The main character is John the Baptist. He was definitely chosen by God, but his life was no walk in the park. He grew up in the desert, and knowing that he was called by God he stayed in the desert, restricting his diet to nothing I would eat. Then he began his ministry, preaching and baptizing, knowing that he was preparing the way for 'the bridegroom'. Once Jesus came on the scene, it wasn't too long before John was thrown in prison. And there he gets one of his disciples to ask Jesus a telling question. 'Are you really the Messiah? Or shall we keep looking for him." Jesus doesn't try answer John personally. He says, in not so many words - look at what I'm doing - and finishes his answer with 'Blessed is the one who does not lose faith in me.' A few days later, John was beheaded. The Sovereignty of God. We certainly don't sing about it much in church. Its not really a message that gives me the warm fuzzies. Of course, the book doesn't end that way. But sometimes it seems like some days of our lives do end like that. And you know what? Be Encouraged! Even if you do have days that end with thoughts going through your head similar to the audience that Malachi was writing to, at the end of it all, 'The Sun of Righteousness will rise with healing in his wings.' I also take encouragement from a verse Romans 'It God's kindness that leads us to repentance'. It gives me a reason as to why people who don't currently acknowledge God seem to have it so good. And finally, keep the faith. Don't let your current trials push you away from God. Remember the seed that fell on the good soil, and then let the worries and cares and trials of this life (the weeds) choke it. Romans chapter 9 ends with a reminder that the Jews 'stumbled over the great stumbling stone.' And what was that? 'They were trying to be saved by keeping the law and being good instead of by depending on faith ... Those who believe in Jesus will never be disappointed'.